In addition to parents and teachers, a coach can be one of the most important role models for a child. A great coach has the power to change the trajectory of a young athlete’s life and to impart lessons that resonate for years to come. One organization that tries to harness the transformative power of coaching is the Positive Coaching Alliance. The PCA’s mission is to develop “better athletes and better people” by providing resources to youth and high school sports coaches across the nation. Many highly successful coaches are on the PCA’s advisory board, including Phil Jackson, Doc Rivers, and Dusty Baker. This outlook on life is a big part of positive coaching. Great coaches help young athletes focus on things that they can change rather than forces that are beyond their control. A child may not be able to control how tall he is or what natural athletic talents he was born with, but he can control his effort, learning, and his ability to deal with mistakes and other challenges. To help young athletes focus on Effort, Learning, and overcoming Mistakes, the PCA teaches the “ELM Tree of Mastery”, which distills this idea into a memorable acronym. One of the most important parts of the “ELM Tree of Mastery” is dealing with mistakes. On the field, and in life, there can be a natural tendency to dwell on your mistakes and beat yourself up over your failings. This is counterproductive because it leaves you feeling distracted and lacking in self confidence. On the other hand, mistakes shouldn’t be flat out ignored, because they have real consequences and there is value in learning from them. The Positive Coaching Alliance maintains that the best way to deal with a mistake in the middle of a game is to quickly address it and move on. Many coaches have adopted the idea of “flushing your mistakes”. If a young athlete makes an error during a match, a coach will tell her to “flush it”: put it behind you and keep playing. 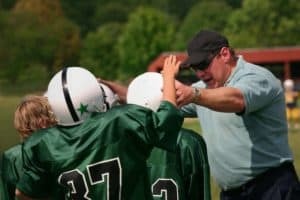 After the game, a coach can have a more indepth discussion about how the player can improve next time, but “flushing your mistakes” is the best way to persevere in the moment. In high pressure situations, like a playoff game or a stressful business meeting, people sometimes become short with each other and overly critical. This negativity can quickly derail your team’s effort and leave everyone feeling dejected. In contrast, a great coach inspires great performances from his athletes by staying relentlessly positive and making his players’ well being his top priority. The PCA uses the analogy of “Emotional Tanks” to illustrate that everyone needs the right emotional fuel to succeed. Successful coaches and successful leaders make sure that everyone on their team feels valued and supported, that their “emotional tanks are full”, before working on the task at hand. Fostering this type of positive atmosphere can lead to great success. Phil Jackson used these techniques to win 11 NBA titles as head coach of the Chicago Bulls and Los Angeles Lakers. A good coach makes sure that his team embodies the age old adage of “being humble in victory and gracious in defeat”. Triumphs and failures happen throughout one’s life, and meeting both with professionalism is the hallmark of a mature person. The PCA makes “honoring the game” a cornerstone of their teachings. When a coach encourages respect for Rules, Opponents, Officials, Teammates, and Self (ROOTS), everyone benefits. Young athletes who respect the ROOTS grow up to become the type of people who make the world a better place. Here at Rocky Top Sports World, we host thousands of inspiring coaches and athletes each year. Located in the heart of the Great Smoky Mountains in Gatlinburg, TN, our 80 acre sports campus is one of the most popular tournament destinations in the Southeast. With seven fields, six basketball courts, 12 volleyball courts, ample bleacher seating, and an onsite grill, we have everything you need for the perfect sports event. To learn about everything going on at Rocky Top Sports World this year, check out our Smoky Mountain Sports Events Calendar. This entry was posted in Trends in Youth Sports on December 28, 2016 by rockytopsports.